Those ropes turn quickly then disappear, other than a whir in the air and a fast tap-tap on the gym floor. Thirty seconds of speed jumping becomes a minute, then three — the equivalent of nearly 800 running steps. But we haven’t seen anything yet at this practice session of the Cary SuperSkippers jump rope team, based at Cary Family YMCA and made up of kids ages 8 and older. "You learn the jump rope short term, and the life skills long term," says head coach Gary Anderson. Jumpers “mule kick,” aka handstand, into double Dutch ropes, which turn in opposite directions, and perform fancy footwork to high-energy beats. Kids “handle switch,” swapping spots with rope turners in the blink of an eye, crouch down and pop back up without missing a jump, and high-step with hands behind their backs. It’s all impressive, and how the Cary SuperSkippers earned back-to-back USA Jump Rope National Championships, in 2012 and 2013. They also have hundreds of medals in USA Jump Rope and AAU Nationals to their credit and earned an overall gold in 2006 FISAC World Competition. In 2012, SuperSkippers even performed a double Dutch routine on TV’s Live with Kelly, and were surprised onstage by a visit from First Lady Michelle Obama, who jumped rope with them. But competitions and appearances are just part of the SuperSkippers experience, their coach says. 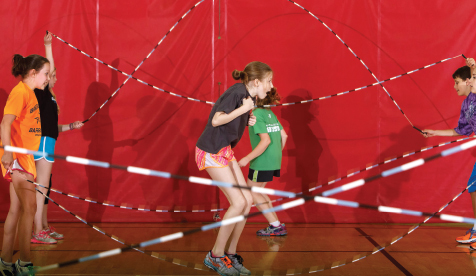 The SuperSkippers program, launched in 1994, has grown to the point that Anderson and his Y colleagues are now working to start jump rope clubs among the 13 branches of YMCA of the Triangle. 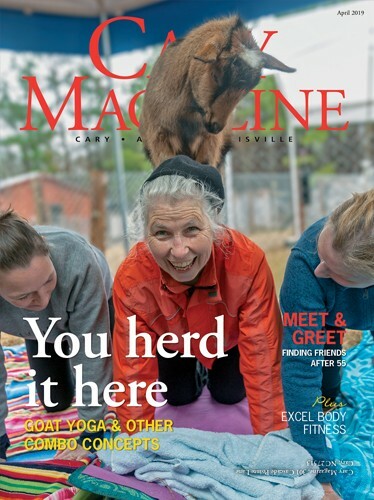 “Over the next year we expect to raise awareness, perform at other branches, and start non-competitive clubs to make jump rope accessible,” said Emily Behr, branch communications and administration director for YMCA of the Triangle. Anderson, a longtime sports coach and USA Jump Rope board member who holds a degree in psychology, notes that Skippers tend to be good students who enjoy additional sports, are hard workers, and stick with the team long-term. “Being on the team teaches good time management, taking responsibility, confidence and patience,” he said. “Skill is not enough — you have to be able to work with others, learn how to help someone else overcome a challenge. The teamwork concept is evident at practice, where 11-year-old Grace helps Kennedy, the youngest member of the team, wrap her rope. Later, Kennedy partners with 9-year-old Julia to develop a routine. The ropes get tangled, but there’s laughter in the interaction. “Can you do this?” is a common refrain among the sea of bobbing ponytails, freckles and braces. Even the youngest team members create their own single and partner routines, with help from Anderson and assistant coaches. Anderson choreographs group routines to carefully-selected music. His mantra? “I’m always thinking, ‘What’s never been done?’” he said. But even at competitions, teams share routines with others. “No secrets, it’s that kind of community,” Anderson said. Next up for his 72-member team is the 2014 U.S. National Jump Rope Championship, June 26-29 in Long Beach, Calif., and the AAU Junior Olympics, July 23-26 in Des Moines. Scoring for jump rope routines is similar to figure skating, Anderson says, with points for difficulty, presentation and required elements. Team members train three days a week — five at competition time — on speed, endurance, strength and freestyle skills. While the routines are complicated, required equipment is simple: running shoes and a long-handled, plastic “licorice rope,” priced under $3. Heavier beaded ropes, more visible and better at holding shape during tricks, are also common. Tryouts for the Cary SuperSkippers are held annually in August. Information and videos regarding required skills are posted at ymcatriangle.org, and the Y offers summer camps focused on developing these skills, beginning this month. For more about the team, see superskippers.org.